With my foray into parenthood I knew that feeding would play a big part. Spoon feed or self feed? Then, the big questions start: What to pack for lunch? 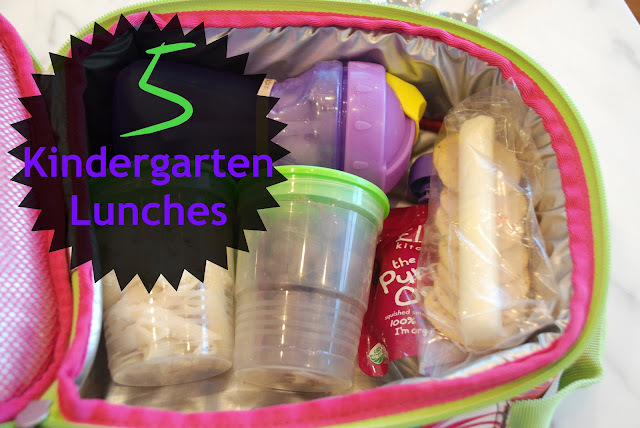 My daughter is now in kindergarten and while I'm not purporting to be an expert (I defer to my local lunch blogging genius Wendolonia), I did manage to make 4 lunches and 1 snack that my daughter loved (and actually ate)! Half day, so I just sent a yogurt for snack. If I remember to pack lunch the night before I pop the whole thing in the fridge. Just remember to unzip the bag so the cold air can get in! Leftover pasta with cheese packed in a Ball Plastic Jars (the best way to pack a no-waste lunch), champagne grapes, a fruit squeezy, and string cheese and crackers for snack. Plus water with ice cubes, this acts as a bit of an ice pack for me. Greek Yogurt, apple slices, pretzel rods, a fruit squeeze pouch and a string cheese for snack. Water. I also added a note, and her sunscreen stick. It's been super sunny here and if I put the sunscreen in her lunchbox she will remember to put it on before recess. Peanut Butter and Jelly Sandwich (if you cut it in half it fits in the bigger Ball plastic container), grapes, string cheese, pretzels and a fruit squeeze for snack. Water. Hard boiled egg, apple slices with peanut butter (put the peanut butter on the bottom of the container, then the apple slices standing on end on top), string cheese, a fruit squeeze, and champagne grapes for snack. Water. What are some of your go-to faves? A meat free school? I've never heard of such a thing! All our schools here are peanut free, but PB&J is out. Luckily, she won't eat that anyway because since her schools and preschool have always been peanut free, she now thinks peanuts are poison. :P We do little containers or fruits and veggies, sandwich or mini pizza, apple sauce or yogurt, and some kind of home-baked treat. Pretty boring standard stuff. Loved seeing what you do for lunches! You know you live in the Bay Area when... My brother (who lives in Berkeley) is an ardent vegetarian. He will love to know there's a meat-free school in his midst. Love the lunch ideas. I'm curious about the Ball jars. I have some of those. Is there some reason why you use them over other types of containers? why meat free? I'm new to lunches for school as well. I ordered one of those bento boxes from PBK so I hope to try and use that periodically. I stuck string cheese in E's, a fruit, water, cheez its, goldfish, sandwich, etc. She asked for hummus and crackers the other day! I have never heard of a meat free school. I can't imagine that would go over very well here in the South. My dad finds it completely odd that ML and I eat vegetarian almost every day... except for eating out and that Noah still has not had any meat or dairy products. Those lunches are so cute! I've never heard of a meat free school, but that's kind of a neat idea! We'll probably have to do a lot of gluten-free dishes and lunches for when we have children. Neither my husband nor I are gluten-free but his mom and sister have Celia disease and since it's genetic and stronger in women we have high chances of having a daughter with a high gluten allergy. My girls are in 7th grade and believe me, the lunch packing thing doesn't stop! They love bringing instead of buying. Love the way you packaged the PB&J! I wanted to comment on this post earlier this week, but of course my life has gotten in the way! I am 52 years old and have not had a "lunch hour" in over 25 years. I still pack my lunch, but generally bring leftovers of some sort--pasta, quesidilla, what have you. I do have the use of a microwave. Because I eat breakfast so early (6:30 am), I am generally starving by lunch time(11:45), so I always pack a snack. Usually it's fruit or yogurt with granola or popcorn. On another note, I could make a really awful comment about a "meat-free" school. But this is a family blog, so I won't. Meat Free? Why I don't understand and how do you compensate for protein? Great ideas though! Pizza Muffins are really great as well ifyou have never tired them. I would love it if you would come and share it on I Freakin' did it Fridays @ Miss Information! Saw this on 36th Avenue and pinned for my sister. She has a precious K5 daughter and I think these are great ideas. :) She can take meat but not peanut butter! So excellent to hear about this meat-free school!!! We live in San Francisco, but are looking to make the move to the East Bay in the near future so I'm curious as to which school this is if you don't mind sharing. What fun lunches! My older kids won't let them make home lunches anymore but I have a first grader who loves them. Thanks for your ideas! I've never heard of meat free schools either. Thanks again! Thanks for these great lunch ideas. Like many others who commented, I'm really curious why the school is meat free. I'd love to hear the answer. I hope you’ll visit "One Creative Weekend" on OneCreativeMommy.com (open every Fri-Wed) and link up this idea and anything else you’d like to share. (There is one link up for Halloween projects, and one linkup for everything else.) I hope to see you there! Where can I buy some of those jars? if your kids like peanut butter, there is a product called "no nuts" peabutter made from peas. it tastes just like peanut butter.